LAS VEGAS—HomeKit was teased as part of iOS 8 way back in June at WWDC, but we’re just now seeing the first crop of devices at International CES. iDevices’ new product, Switch, looks simple enough—it’s a little box that you plug into an outlet, and then plug another thing in. But its simplicity is a great illustration of HomeKit as a whole. Switch is a small rectangular device with a strip of color-changing LEDs across the front, a button on one side, and a power outlet on the other. It’s slim enough that you can plug two in to a standard outlet, and relatively low profile. Since you plug your lamp (or your air conditioner, or your Christmas lights) into the side of the Switch instead of the front, the plugs won’t stick out too far, so you could hide these behind furniture. One of the hallmarks of HomeKit is easy setup. Many smart-home devices start by creating their own Wi-Fi network out of the box, and then you connect your phone to that ad-hoc network, in order to point the device at your real home network, and log in with your password. HomeKit ditches that entire process. Switch contains both Wi-Fi and Bluetooth LE, so it connects with your iPhone effortlessly—you can even ask Siri to look for HomeKit devices in your vicinity. Then iOS 8 handles adding the HomeKit device to the same home Wi-Fi network your phone uses already. If you have more than one iOS device, you can use iCloud Keychain to decide which iPhones and iPads can control which HomeKit gear. HomeKit devices don’t need a central hub, either. iDevices’ CEO Chris Allen explained to me that since the device has Bluetooth and Wi-Fi, no hub is needed—think of it as a tiny hub in itself. iDevices built its own cloud that the Switch can connect to when you want to access it from outside your home network. 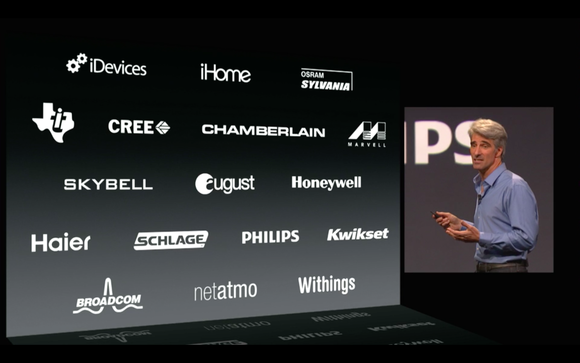 iDevices is one of the first HomeKit partners, shown on this slide at WWDC. To make a great smart home product, hardware is only half the battle—the app has to look good and work well too. iDevices’ iOS app lets you customize the color-changing LEDs on the Switch, which can act as a nightlight, as well as turn the plugged-in device on and off, and create scenes of multiple products grouped together. The company is partnering with Schlage, Chamberlain, and Honeywell, so the iDevices app will be able to fully control HomeKit-compatible locks, garage door openers, and thermostats too. The app looks great, and you can even customize it with photos of each of the rooms you’re setting up Switches in. Once you set up scenes, you’re ready to use HomeKit’s other killer feature: Siri integration. You could tell Siri you’re going to bed, so start your nighttime scene, and she could double-check that your door is locked and your garage door down, adjust the thermostat, turn off the lights, and turn on your white noise machine. I was really impressed by Switch. A connected plug is not a new idea, but between the easy setup, attractive app, and the ability to control it with Siri without even opening the app, Switch is a great example of how HomeKit can smooth out some of the bumps in your road to a connected home. Plus, with a price point of $49.99, the barrier to entry is low. Switch will be available in the middle of this year.